Though he should be focused on governments, the new High Commissioner for Human Rights will also need to hold senior UN officials to account for undermining rights, as recent events in Kenya show. As the new High Commissioner for Human Rights, Prince Zeid, assumes his duties he will face many challenges in fulfilling his task of promoting and protecting human rights worldwide. In the face of widespread government hostility to the work of his Office, he will need all the help he can get. It is a shame, therefore, that he cannot expect the unequivocal support of his UN colleagues in other agencies and departments. Almost two decades after the UN promised to ‘mainstream’ human rights, some senior UN officials still shy away from defending human rights, and even side with those who would prioritize ‘stability’ over fundamental rights. A good example arose in Kenya last week. Kenyans held a political rally to mark the anniversary of a momentous event: Saba Saba – Kiswahili for ‘seven seven’ – so named to commemorate the 7th July in 1990 when Kenyans turned out in their thousands, despite intimidation and attacks, to demand pluralism and the end of the one-party state. Many people died that day, thanks to a brutal government crackdown that also saw scores arrested. But their sacrifice was ultimately rewarded: in December 1991, Kenya returned to multiparty politics. The unfortunate reality with autocracies and non-responsive regimes is that sometimes people need to stand up, even if they get shot down in response. This year, thousands of Kenyans invoked the memory of Saba Saba in demanding a national dialogue on a multitude of issues adversely affecting them. Unfortunately, a chorus of voices asked them to sit down before they even had a chance to stand up, asserting that peaceful assembly was a recipe for chaos. And shamefully, these voices included the UN Resident Coordinator Office in Kenya (UN-Kenya), on behalf of the entire UN-Kenya system. 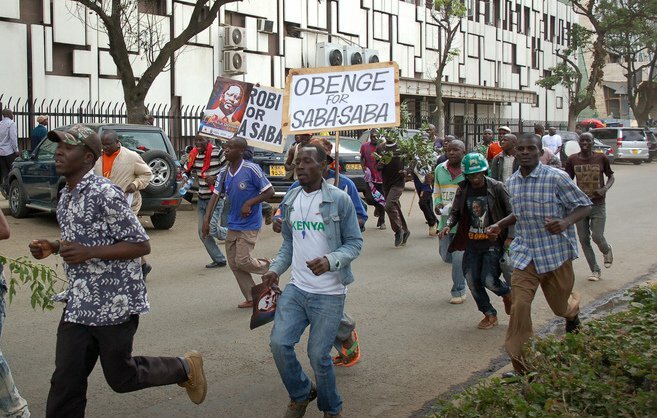 CORD supporters demonstrating in the city centre during the Saba Saba rally day in Nairobi, Kenya on July 7, 2014. On July 3, UN-Kenya joined the Kenya Private Sector Alliance (KEPSA) in a joint statement of concern – a condemnation, really – about the Saba Saba rally planned by the opposition Coalition for Reforms and Democracy (CORD). The business community’s objection to the rally was no surprise, as it often, and wrongly, believes that short-term stability—even if forced—is better than long-term democracy (an argument global companies recently put forward in Hong Kong). But why should UN-Kenya reflexively align itself with business rather than civil society or people demanding their rights? The almost 500-word statement mentions “economy” or “economic challenges” five times. “Freedom” appears twice, but the words “human rights,” “self-determination” and “accountability” are conspicuously absent. The joint statement caught my attention partly because the role of multilateral organizations in promoting assembly and association rights will be the topic of my next report as UN Special Rapporteur. It also caught my eye because it was tone-deaf to supporting human rights. Kenyans today may not be living in a one-party state, but they are lurching toward one. Insecurity is on the rise, with increased extrajudicial killings and arbitrary detentions. Members of the political opposition and independent civil society voices are increasingly stigmatized, harassed, jailed and even accused of terrorism. Peaceful assemblies are viewed as criminal acts. There is palpable and widespread discontent. We know that human rights work receives only 3% of the total UN budget, but that does not mean that it should receive only 3% of the UN’s attention. And yes, there is tension. But it has nothing to do with peaceful activists taking to the streets to demand better for their country. It has more to do with scores of ordinary citizens being gunned down across the country while the government does little to stop it, and as ingrained corruption rots Kenyan society and its values. Kenyans don’t want violence; they have had enough already. What they want is accountability, ethnic equity, participation and good governance. And with that, stability will follow. In the end, the Saba Saba rally ended peacefully. But that’s not really the point. The ability to peacefully assemble is both a Kenyan constitutional right and a universal fundamental right. It is a cornerstone of democracy that breeds pluralism, diversity of voices and yes, even stability. Assemblies should be presumed to be lawful and peaceful until they are shown to be otherwise. No UN agency or program should need to be reminded of this. Why is the onus on citizens to forsake their fundamental rights in favor of ‘stability’ – an illusory concept anyway when it grows from the seeds of corruption, cronyism and repression? Why is UN-Kenya hanging them out to dry, rather than stepping up to defend their fundamental rights? The joint statement was shocking, and contrary to everything the UN should stand for. While it is governments that vote at the General Assembly, the fact is that ordinary people are entitled to a voice. They are the ultimate clients of multilateral organizations such as the UN, and the source of legitimacy for the governments that represent them there. Taking to the streets, often at the risk of life and limb, is one of the ways they can make their voices heard. Human rights are supposed to be a one of the three pillars of the UN system, alongside security and development. But right now they look like a third wheel. The High Commissioner’s main task is to hold governments accountable for the human rights pledges they make. Sadly, as the Kenyan case illustrates, he will need to divert quite some time to similarly hold the UN system to account and to make this pillar real rather than rhetorical.